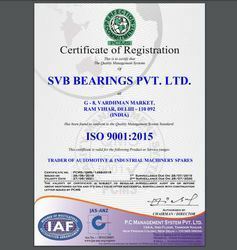 Established in the year in 2006, we SVB Bearings Pvt. Ltd. are an ISO 9001:2008 certified company are among the prominent and topmost wholesaling, trading, exporting and importing of the finest quality of Bearing Bush, Lubricating Bush, Bronze Bush, Metal Bushes, etc. Offered products are widely demanded by the different industries due to their flawless finish and high-grade quality. Moreover, we are offering these products to our clients as per their precise requirements. Owing to their customized designs, these products are demanded by a huge number of clients. We have established a strong association with some of the most reliable vendors of the market, to meet the demands of our precious clients in the most efficient manner. They hold immense expertise in their field of working and are acknowledged for using the optimum quality of raw materials and technology during manufacturing the offered products. Our vendors were chosen based on market credibility, reputation, and ability to cater the bulk requirements in the most effective manner. By using upgraded equipment, our vendors manufactured the offered array in tune with the latest market trends. We import from China, South Korea, Germany, Singapore. We export our products to Europe, UAE, Bangladesh. Under the leaders of our mentor, Mr. Vijay Gupta, we have been capable to gain a huge clientele across the market. Banking on his knowledge and experience, we are catering to the precise requirements of our valuable customers in a streamlined manner. We are increasing our reputation in the market day by day just because of his valuable assistance. Trading, Importer and Exporter of multiple range of Self Lubricating Bushes and Bearings. We provide qualitative range of Bushes and Bearings that have garnered positive feedback and patronage fro clients with varied requirements. Our high-quality range, customer service, timely delivery of consignment and cost-effective prices have endeared us to our clients who reciprocate our efforts to satisfy them with their loyal patronage. We have clients from varied industry verticals. To cater our patron’s requirements in best possible manner, we are backed by a rich vendor base in the market. These vendors are highly demanded across the market for their superior quality products. Apart from this, our associated vendors are well versed with our client choices and hence they are offering all these products as per their demands. With the help of these vendors, we are able to cater the bulk needs of our esteemed clients as these are backed by an ultramodern manufacturing unit. All these vendors are chosen after a deep inspection. Our experienced and talented team members are the strongest pillars of our company. These professionals are well versed with the latest techniques and innovations to offer world-class products to our customers. These team members hired after a thorough inspection of their competence, expertise and educational achievements, which they are applying most effectively to offer the best outcome. Further, our personals encompass vast industry experience and are well-aware with every cons and pros of the industry. We are one of the leading organizations of this domain, involved in offering the wide range of Bushes and Bearings to our valued customers. Offered products are widely demanded by the customers for their optimum finish and sturdy construction. Apart from this, we are offering these products at reasonable prices to the customers. Our organization is the best resources to obtain these products from the market.